Purpose: In this tutorial you will learn how to set up and execute exciting calculations for simple molecules such as the carbon dioxide (CO2), water (H2O), and pyridine (C5H5N) molecule. It is also shown how to calculate and visualize molecular orbitals, with explicit application to the HOMO and LUMO of carbon dioxide. PLOT-relaxdistance.py: Python visualization tool for following relative atomic coordinates of atoms during the relaxation process. PLOT-torque.py: Python visualization tool for the total torque during relaxation. PLOT-centerofmass.py: Python visualization tool for the cartesian components of the position of the center of mass during relaxation. 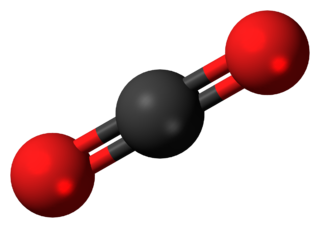 The CO2 molecule is a linear one with the two oxygen atoms located symmetrically with respect to the central carbon atom, as can be seen in the following figure taken from the wikipedia page of Carbon dioxide. In order to perform the calculation, we have to let exciting know that we would like to consider an isolated molecule with a certain atomic configuration. However, all calculations performed by exciting assume a three-dimensional periodicity along the directions defined by the lattice vectors. Therefore, when considering a molecule one has to prepare a special three-dimensional crystal where the distances between a molecule and each of its replicas are large enough so that each molecule behaves as it would be isolated. The procedure one has to follow in this case is illustrated in the next picture in the simplification of only two dimensions. The first thing to do is to determine the size (expressed by dx, dy, dz along the three cartessian directions) of the molecule you are investigating, as illustrated in the left panel of the picture above. Next, some vacuum (expressed by vx, vy, vz) is added, as you can see above in the middle panel. The amount of vacuum has to be chosen in such a way to prevent intermolecular interactions. Finally, a cartesian periodic cell is created with basis vectors of amplitude (dx+vx, dy+vy, dz+vz) along the corresponding cartesian axis (see right panel). The first step is to create a directory for each system that you want to investigate. Thus, we will create a directory CO2 and we move inside it. 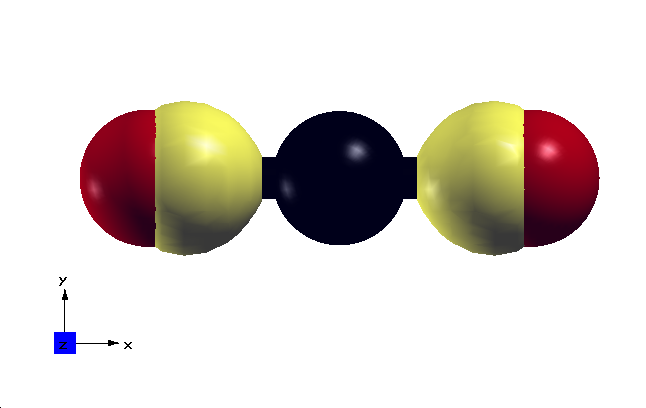 An example for an exciting input file (input.xml) which is needed for the calculation of the optimized structure of the CO2 molecule is given in the following. Some of the elements and attributes appearing in this input file should be already familiar to you from other tutorials. Here, we will discuss in details only those elements and attributes which are significant in molecule calculations. First, we analyze the first line of the element structure. are assumed to be given in cartesian coordinates. This option is particularly useful when dealing with molecules. and correspond to a linear molecule of size of about 5 Bohr lying along the x axis and a vacuum of 5 Bohr along each cartesian direction. The next new feature that can be seen in the input file is the attribute lockxyz which is always located inside the atom element. means that, for this atom, the x and y cartesian coordinates are allowed to change during the relaxation, while the z component of the position vector is kept fixed. Furthermore, when considereing molecules, it is always convenient to keep fixed the position of one of the atoms of the molecule in order to avoid the translational motion of the molecule as a whole. We impose this condition on the central carbon atom. The next important setting, visible in the input file input.xml is that the muffin-tin radii for the atomic species are given explicitly and assume values which are significantly smaller than the default values. This is necessary due to the short bond lengths between the atoms in the molecule. Notice that, contrary to all the crystal structures you have considered in these tutorials, the groundstate element does not contain explicitly the attribute ngridk. This is completely equivalent to set ngridk to "1 1 1" as in the following example. This choice is necessary for dealing with a molecule for which one assumes that no interaction is present between the molecule and its periodic replicas. The next thing that can be noticed in the input file, is that the attribute rgkmax of the groundstate element has the value "4". This value is significantly smaller than typical values used for crystals (where converged calculations require a value of rgkmax around "7" or "8"). Due to presence of the vacuum region which reduce the number of plane waves necessary to describe the interstitial region in the LAPW method, setting rgkmax to "4" (or even to smaller values) is typical for molecule calculations. The final remark concerns the attribute printtorque (of the element relax) which has been set to "true". At each optimization step, this setting produces in the output file "INFO.OUT" two lines which contain the cartesian components of the center of mass and total torque, respectively. These lines should look in general like the following. The center of mass and the total torque are well defined only when dealing with isolated systems such as those considered in this Tutorial. In particular, towards the end of the optimization run, non vanishing values for the components of the total torque (numerically, larger than about 10-4 Ha) may indicate that the molecule as a whole has started to rotate or oscillate. This would prevent the relaxation to reduce the atomic forces below the desidered threshold. To perform the struture optimization of the CO2 molecule you have to run the script EXECUTE-single.sh in the directory where the input file input.xml has been created. If you want to save the results of this run in the subdirectory 1-CO2 you should run as in the following. 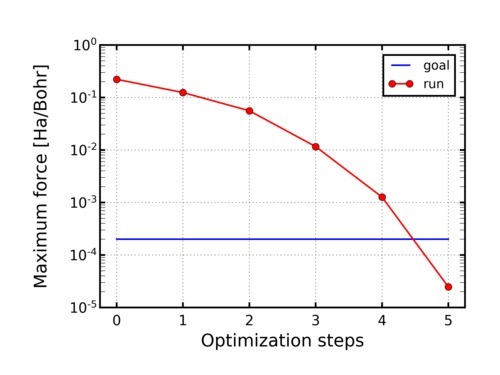 The analysis of the result of the optimization run can be visualized with the help of the scripts already introduced in Simple examples of structure optimization. The output of this script (files PLOT.ps or PLOT.png) should look like the following. 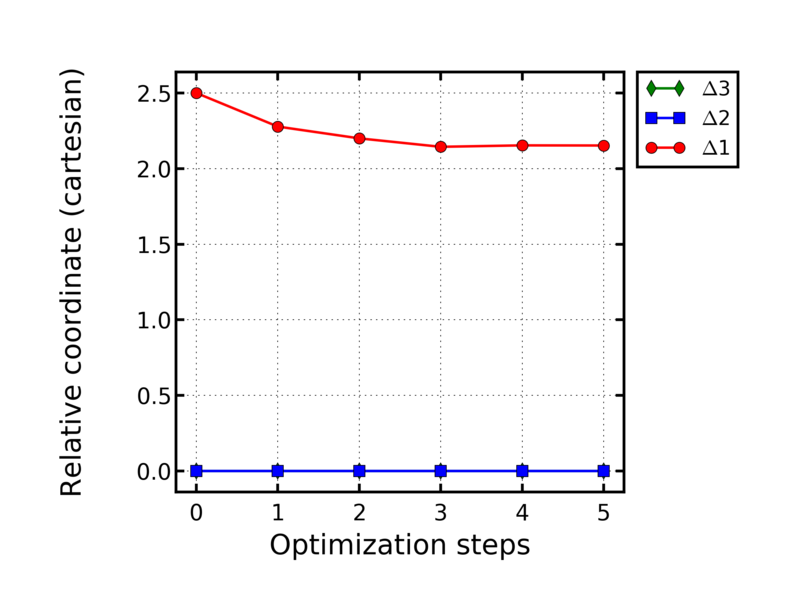 We can see that the optimization required 5 steps to reach the target minimum force. Further information is provided using the script PLOT-relaxdistance.py. Notice that in this case crystal axes are parallel to the cartesian directions. One can also notice that, as expected, the y (2) and z (3) components do not change during the optimization, while the bond length along the x (1) axis is reduced from the initial value and reaches a value slightly larger than 2.1 Bohr. Perform the optimization of the CO2 molecule starting from a planar configuration by setting initial coordinates and the attribute lockxyz of the two Oxygen atoms to the following (Notice: in comparison to the previous input.xml, the lock on the y component has been deleted!). Investigate the dependence of the relaxed structure on the amount of vacuum used in the calculation. Try both increasing and decreasing the value used in the example. Investigate the dependence of the relaxed structure on the value of the attribute rgkmax. Change the initial configuration (using low symmetry displacements) as in the following and perform again the optimization in a directory named CO2-low-symmetry. Concerning the results in CO2-low-symmetry. How long does it take to run the optimization in this case? Why? 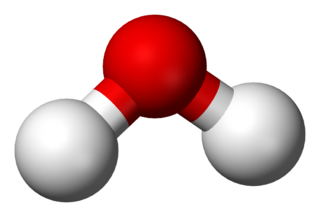 The H2O molecule is a planar one with the two hydrogen atoms located symmetrically with respect to the central oxygen atom, as can be seen in the following figure taken from the wikipedia page of water. Also in this case , the first step is to create a new directory for the system that you want to investigate. Thus, we will create a directory H2O and we move inside it. An example of input file (input.xml) for the optimization of the atomic structure of the water molecule is the following. Replace in the input.xml the string "$EXCITINGROOT" by the actual value of the corresponding environment variable. Try to analyze this input file in the light of the experience gained with the previous molecule. Change the initial configuration (allowing for low symmetry displacements) and perform again the optimization. Use different values of the attribute method of the element relax for the structure optimization. 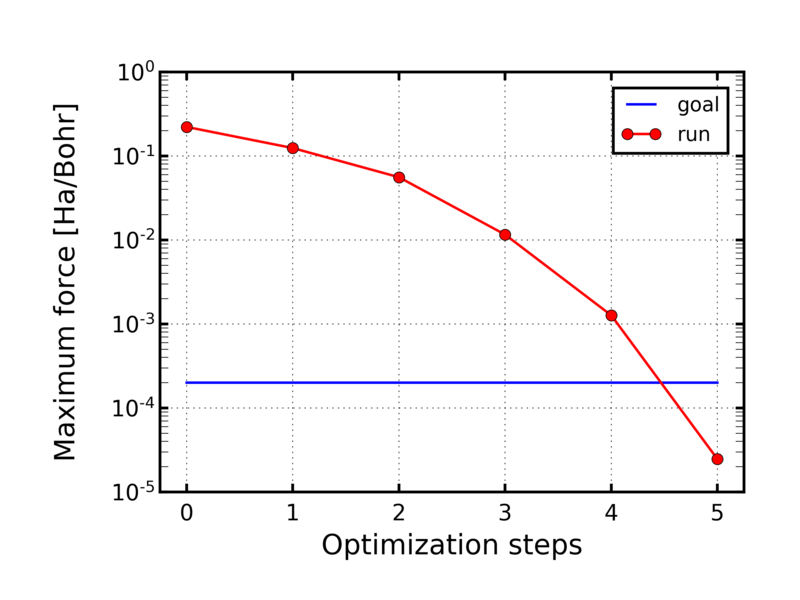 Perform the convergence study of the optimized structure as a function of the value of the parameter rgkmax. 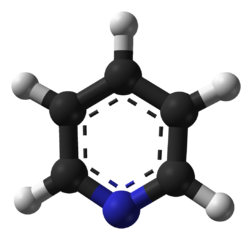 Pyridine is a basic organic compound with the chemical formula C5H5N with an atomic structure similar to benzene, as can be seen in the following figure taken from the wikipedia page of Pyridine. Create a directory Pyridine and move inside it. An example of input file (input.xml) for the optimization of the atomic structure of the pyridine molecule is the following. Perform similar investigations as for the other molecules. In this section, we will learn how to plot molecular orbitals (MOs). More specific details about visualization tools available in exciting are reported in How to visualize Kohn-Sham states. 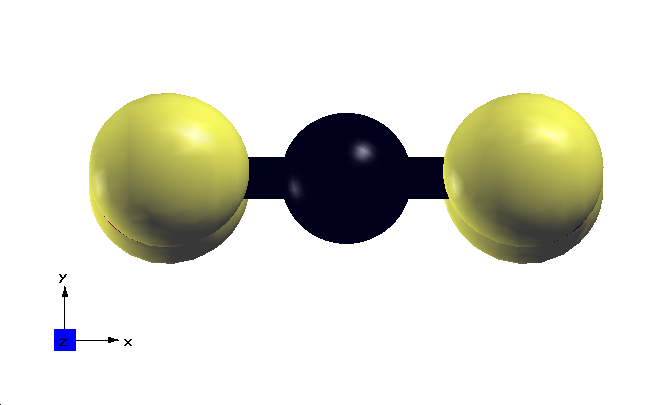 As a test example, we will consider here the CO2 molecule. Hence, we can refer to the directory created for the runs described in Section 1. Please notice that in the structure element we replaced the atomic positions given in the input file in Section 1, with the optimized positions obtained from the relaxation performed in the same section. As usual, before running any calculation, replace in the input.xml the string "$EXCITINGROOT" by the actual value of the corresponding environment variable. In the input file shown above, the element wfplot inside properties triggers the calculation of the MO. wfplot includes the plot3D subelement, which in turn enables the 3D visualization of the orbital. The state which one wants to plot is defined by the two elements kstlist and pointstatepair. Inside the element pointstatepair a pair with k-point (first integer index) and eigenvalue (second integer index) number must be specified. 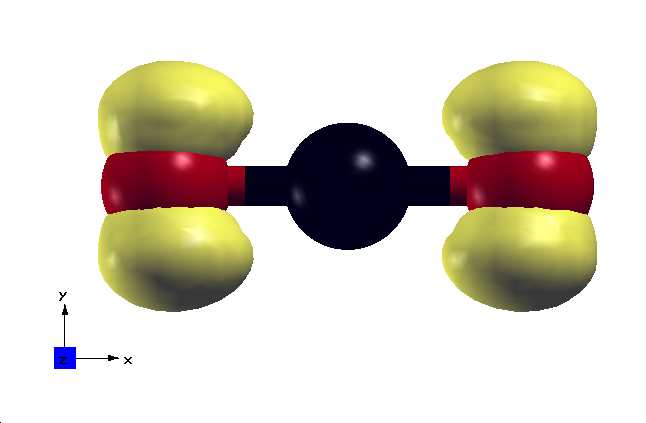 As we are dealing here with an isolated molecule, only 1 k-point is present, therefore, the first index is always 1 for molecules. The second index, related to the eigenvalue labelling, is chosen as the highest occupied MO (HOMO), which corresponds to 8 in the CO2 molecule, as indicated in the file EIGVAL.OUT, where a map of eigenvalues is stored. Occupied (unoccupied) energy levels are identified by a nonvanishing (vanishing) number in the neighboring column. Kohn-Sham states with the same energy are degenerate. In particular, we notice that the HOMO of the CO2 molecule is doubly degenerate. Additional elements are box, origin, and point. The element box is specified by the attribute grid, which defines the quality of the plot: The larger number of points in this mesh, the more resolved the resulting plot. Be aware that the increase of the number of grid points impacts on the computational costs! The elements origin and point allow to define, respectively, the origin and the vectors spanning the space region where the squared norm wave function is calculated. The values of the attributes coord are expressed in lattice coordinates and are chosen here in order to correctly place the orbital with respect to the atomic positions. When the run is completed, move to the newly created directory HOMO_1. Applying the procedure reported in How to visualize Kohn-Sham states for the visualization of xsf files using XCrySDen, we can now plot the isosurface of the probability density of the HOMO. Press on the main window Tools -> Data Grid. A new window appears. Press OK: The previous window will disappear and a new window will appear with the control panel of the data grid to be plotted. In the middle of the left column a box appears, indicating Minimum grid value, Maximum grid value, and Isovalue next to an empty box. In this box the user has to type the isovalue with which the isosurface is to be plotted. As a rule of a thumb, 10% of the Maximum grid value is a reasonable value. Type the isovalue and press the Submit button on the bottom right of the window. The isosurface will now appear on the main window. From this plot we observe that the HOMO of CO2 is correctly localized on the oxygen atoms of the molecule. As we noticed already from the file EIGVAL.OUT that the molecule CO2 has a doubly degenerate HOMO, we now plot the Kohn-Sham state corresponding to index 7 in the file EIGVAL.OUT. To do so, we first move to the parent directory. and, after the run is completed, move to the directory HOMO_2. As a result of the calculation run, another file WF3D.xml is generated. Using the same procedure described above we can generate the file HOMO_2.xsf, which can be visualized using XCrySDen obtaining the following plot. The degeneracy of the two HOMO orbitals is evident: The shape of the isosurface is the same, while its orientation with respect to the coordinate system is rotated by 90 degrees. Finally, we also calculate and plot the lowest unoccupied MO (LUMO) of CO2. The procedure is now known. Repeating the standard visualization procedure inside the directory LUMO, we obtain the file LUMO.xsf which originates the following image (using as isovalue 0.015). Inspecting the file EIGVAL.OUT, plot the probability density of deeper occupied and higher unoccupied MOs than HOMO and LUMO, respectively. How do high unoccupied MOs look like? Pay attention to the pairs of degenerate states: what is the character and the spatial distribution of these orbitals? Increase the amount of vacuum in the unit cell, by increasing the lattice vectors $a$, $b$, and $c$ to 12, 7, and 7 Bohr, respectively. Is there an influence on the MOs? What happens in particular to the empty states? 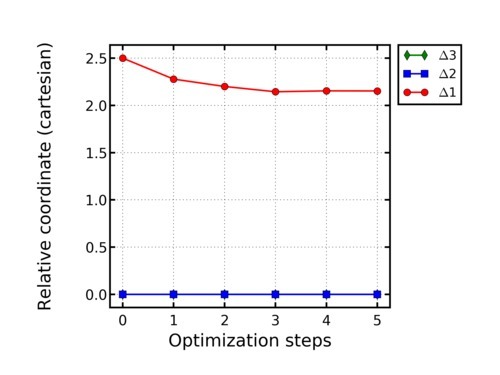 What happens to the plots by choosing a different isovalue? Visualize the HOMO and LUMO for the water and pyridine molecule, too.